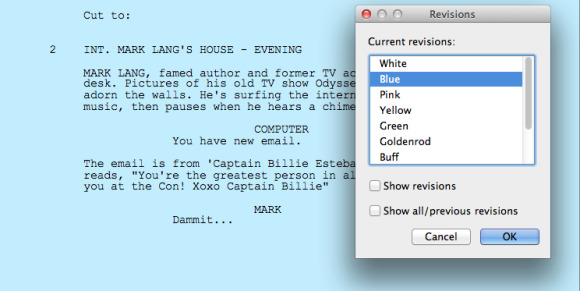 Fade In is a fully featured professional screenwriting app for Mac OS X, Windows, and Linux, and is priced affordably. It has all the features you’d find in the more expensive apps, such as Final Draft and Movie Magic Screenwriter, and there’s even free and paid iPhone, iPad, and Android apps available. As an independent filmmaker for many years who has written screenplays in AppleWorks, Word, Movie Magic Screenwriter and, for over a decade now, Final Draft. Fade In, from GCC Productions, offers many of the same features found in the pricier apps, and far more than the free and discounted ones, such as Celtx. Easily organize and keep track of scenes, characters, and more. Like all major screenwriting software, Fade In makes it easy to just write; it handles formatting of scenes, scene headings (such as INT. HOUSE - DAY), character names, dialogue and more, using the tab and return keys. It keep track of character names and locations, so you don’t have to type them out completely—just the first couple of letters. Fade In also supports CONT’Ds and MOREs, has a pretty good spellchecker and dictionary. You can number scenes, and there is a full screen mode that keeps you focused on writing. They also provide several templates, including screenplay, stage play, television: half-hour sitcom, and television: one-hour drama. If you’ve written a script, or read a book on screenwriting, such as Screenplay by Syd Field, you know it’s all about staying organized. Fade In offers the usual organizational tools, such as creating index cards, or a list of your scenes. What I really like is organizing by color, and not just all the scenes, but by entire sequences, or import plot points in the script. I really like this fully customizable way of organizing a script. The revision mode allows you to color code or lock pages. This is especially useful when it comes to revisions, whether you’re doing another draft to tighten the script, or on-set rewrites. In the revision mode, you can lock pages or scenes, color code the latest scene rewrites, and manage everything. You can also create various reports and breakdowns that are needed for budgeting and scheduling. 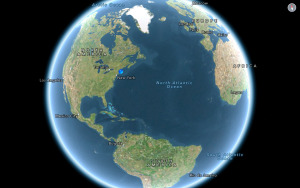 You’ll be able to export into a format that can be easily opened by a variety of pre-production software. A common and growing trend in screenwriting software is the use of different apps. Final Draft is the industry standard, but many filmmakers and writers are turning to a variety of apps, including Fade In, Celtx, Adobe Story, and more. This does have the potential to be difficult if your co-writer is using Celtx, while you write with Fade In. The only unity when opening the script files is using Final Draft’s .fdx format, or .rtf. Fortunately, Fade In can open, edit and export RTF and FDX, along with .epub, PDF, XML, and more. 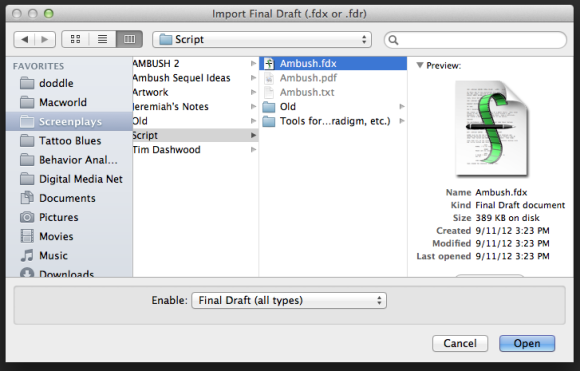 You can import, edit, and export the Final Draft .fdx format. In this age of cloud computing, it’s great that you can access your script online or from another computer via Dropbox. I like this, because Dropbox is proven, and I don’t have to pay a monthly or annual fee for a cloud service on top of the cost of the app. There are two Fade In Mobile apps, for iOS (iPhone and iPad) and Android, one is free and the other is paid, but has many more features. You can import screenplays you’re working on in the desktop app via Dropbox, and work on more than one script at a time. I recommend going with the paid app. With all the major features—and then some—found in industry standard Final Draft, but at a quarter of the price, GCC Productions' Fade In is a great and affordable screenwriting app. It's ability to import, edit, and export in the common .fdx format, is a huge plus. But what passes the big test for me is that the program gets out of my way and lets me be creative, while handling the chores formatting, organization, autocomplete typing, and more. Fade In works great, isn't bloated with features, and works well with the Final Draft .fdx format.